Plugins extend the functionality of WordPress’ “core”. Core is what WP can do right out of the box. While some functionality that your site will have will be determined by the theme I built for you (or if I didn’t / you’re not my client, you might want to check out my portfolio to see if we might need to rectify that), plugins are one of the best features of WordPress as they can at times allow you to get more bang with your website, absolutely free. It’s not all good news, though, and it’s certainly not all bad. There are thousands of free plugins available at WordPress.org. There are additionally thousands more plugins that are distributed by other companies or individuals through their own websites. Some of these are free, some require you to pay once up front, while still others require an annual fee. Plugins can break your site, even when you get them from WordPress.org. Free plugins don’t necessarily come with a guarantee, and there is no obligation for the developer to help you if the plugin isn’t working correctly, or even if it breaks your site. I don’t support / fix plugins that you add on your own. I can, however, make recommendations and–at my hourly rate–configure and optimize plugins if you’d like. Just get in touch! There are three ways to install plugins, and the method you choose is typically determined by where you get your plugin. Just go to Plugins > Add New in your WP Admin. Once you’re logged into WordPress, you can just go to Plugins > Add New, or click the Add New button near the top of the Plugins page. A few suggested plugins will appear by default, and you can search for more here. Using the search box near the top right of that page, you can start typing in anything you like. If you already know the name of the plugin you want, and it’s available on WordPress.org, you can type it in exactly, hit Enter on your keyboard, and it should show up. Plugins can be installed, but not activated. You have to activate them for them to actually be working on your site. Once installed, all of your plugins are on the Plugins page. You might find a plugin on some website other than the official WP Plugin Repository. They’ll typically give you a .ZIP file that contains the files to the plugin itself. If you’d like to add this plugin, you can do that via WordPress’ admin area, too. Back in the Plugins > Add New page, click Upload Plugin near the top of the page. Follow along with that process, and don’t forget to activate the plugin when you’re done! FTP / SFTP give you a high level of access to the files that run your website, and certainly open up the possibility of you breaking things or breaking things more by working with these files. You should never edit, delete or move anything outside of the /wp-content folder! Get in touch if you have any questions! Sometimes things go hey wire. Plugin updates fail for whatever reason, and perhaps now you’re getting errors that your plugin can’t be updated, or the plugin is breaking things and you can’t delete it, or your entire site is just busted. Bummer. Luckily, you can use FTP or SFTP to hop onto the server where your site’s files actually live and remedy the problem relatively easily. Note that this will require an FTP client, and a certain degree of comfort copying and pasting files. Don’t know your SFTP info? If you’re a hosting client of mine, just send me an email and we’ll get you sorted. Before you do this, though, if you’re hosting with me or WP Engine, you can go to the WP Engine tab of your /wp-admin area and click Reset File Permissions. This will often resolve any errors where you can’t delete a plugin from within WordPress, assuming you can still navigate around WordPress. More on the WP Engine tab in WordPress can be found here. Once you’ve logged in via FTP or SFTP, you’ll see a file structure similar to this. These are all of the files that come with WordPress by default. We want the /wp-content folder. You’ll want to be specifically in the /wp-content folder. Open up the /wp-content folder and look for the /plugins folder. That’s where we’ll be putting our files. Every plugin has it’s own folder (except for a few very simple plugins that are just one file). If you’re uploading a new plugin, you can drag and drop it from your desktop to this /plugins folder. If you want to delete a plugin that’s already on there, first find the folder that applies to your plugin, but double check you know which folder it is! The name typically gives it away, but sometimes plugins can have similar names. Once you’ve found it, you should be able to delete it. If you can’t, get in touch, it’s probably a bigger issue that will require some additional tools / know how. Sometimes if you can’t delete a plugin, you can still drag it out of the /plugins folder, which will allow you to do whatever else you wanted (upload a new copy of it, or just disable it all together, which is what will happen if you move a plugin out of this folder). This page lists all of the plugins installed on your site, and indicates which are active. If a plugin isn’t activated, you can also delete it here. You can bulk edit things, too, using the checkboxes and the dropdowns near the top and bottom of said checkboxes, such as deactivating multiple plugins, deleting or activating them. Once you’ve activated your new plugin, there are a few things you’ll want to do. Look around WordPress, or the plugin’s documentation on WordPress.org, to find out if you need to configure any settings for the plugin. These will often be in the Settings area of WP, sometimes under Tools, or really anywhere else. Some plugins create their own navigation item, and other plugins–for example those that deal with images on your site–might show up under Media or any other navigation item. A well-written plugin will keep a small amount of settings under the Settings or another existing tab. Once you’ve configured any settings, look at the front end of your site and make sure nothing seems broken. If you’re up to the task, view the source of your site’s front end code and search around for .css and .js. 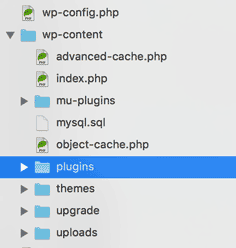 If a plugin is adding these files, especially if it’s more than one of each, and if it’s adding them to pages that are irrelevant to the plugin, your site is now going to be that much slower for having added the plugin. Is the functionality it provides worth it? If so, and you’re concerned about speed (after all, that’s a good chunk of what you paid me for), then you may want to get in touch and we can look into what it’ll cost to optimize your site based around that plugin. If everything checks out, you’re good to go! 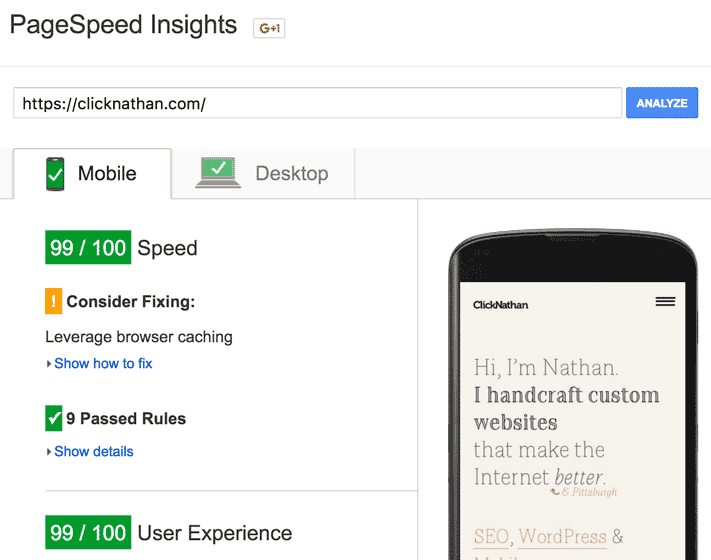 Good Pagespeed results are in Green. Jot down the scores for the various pages you’re testing. Install and activate the plugin, and run those tests again. No effect? Well, if your site isn’t broken, then you’re good to go! Some plugins have absolutely no effect on the front end of your site, and others are just coded really well. Did you lose some points? Just one or two? Maybe it’s no big deal, upward and onward and all that. Lost a lot of points? Are you no longer in the green grading level? Probably time to get in touch to see what we can do about that. What Plugins Does ClickNathan Include with My Custom Site? Gravity Forms, which creates the Forms navigation item in your WordPress admin and allows us to build awesome forms that I have already optimized for you! WP Smush It, a plugin that helps reduce image sizes when you upload jpgs, pngs and gif images. Google XML Site Maps, which creates a file of all of the content on your site that tells Google exactly what you’ve got and where to find it. Some other great plugins out there are Woocommerce, for full on e-commerce, and The Events Calendar by Modern Tribe if you want a calendar with a ton of features that just works really well. Didn’t find what you were looking for? Need custom plugin development or an entire site’s worth of something that just isn’t out there yet?